Can you turn an everyday object into something extraordinary? Orange is one of those colors that people are drawn to on a pillow, a label, or even nail polish when you're feeling crazy; but orange is often overlooked in the makeup world. I think orange is one of the most interesting colors a girl can have in her arsenal. It's bold without being a red, and it immediately wakes up your face, especially if you have yellow undertones in your skin. I'm often inspired by the idea of painting on the face to create shapes and lines. 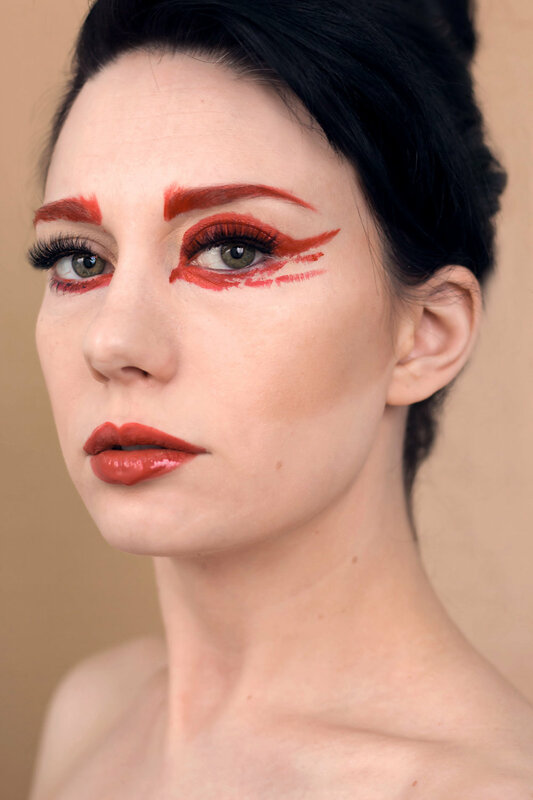 We do our makeup pretty much the same way everyday, and it's fun to ask the question, "what if..." Just like with my red makeup story, I like to start simple and begin pushing the bounds of where I can take a color. All of these looks were created very simply with an Urban Decay orange lipstick that I manipulated with my fingers, brushes, and sponges. Experimenting with lines and shapes can really help you see where color looks good on the face, and where you should probably steer clear. Don't be afraid to put yourself out there, fly your artist flag, and paint your face. It's such a great inspiration warmup. Enjoy playing with colors, and don't forget to start thinking about your items in different ways, and always ask the question, "What if..."
The color red has always been an interesting dichotomy to me. It is represented throughout history, art, and literature as both love and hate, as well as power and passion. In real life it is in the color of roses and other flowers symbolizing beauty, but it is also the color of blood and chapped or burned skin. One thing that's certain about the color red, it is an eye catching color and one that should be treated with some respect. This year when I was deciding on my personal projects I decided that I wanted to focus on color. We have a color of the year from Pantone, and in the midst of all my husband's and my home renovations, color is playing a huge part in setting the stage for each room. If color is so important, then why don't we talk about it more often? Some of these photographs and looks are more "beauty" oriented than others. I think as an artistic and creative person it is important to explore the beautiful and the "other." Sometimes you find beauty in something that doesn't seem beautiful at first glance. Sometimes the "other" can simply be a stepping stone to discovering something more interesting about yourself, your supplies, and your vision. I've been having a lot of fun interpreting and playing with different colors so far this year. Luckily I've also just purchased a clicker which will make taking self portraits much easier (phew!). Here's to exploration of the beautiful and the "other," as well as stepping outside of our comfort zones. Do you feel like you're acquiring more than you're creating?